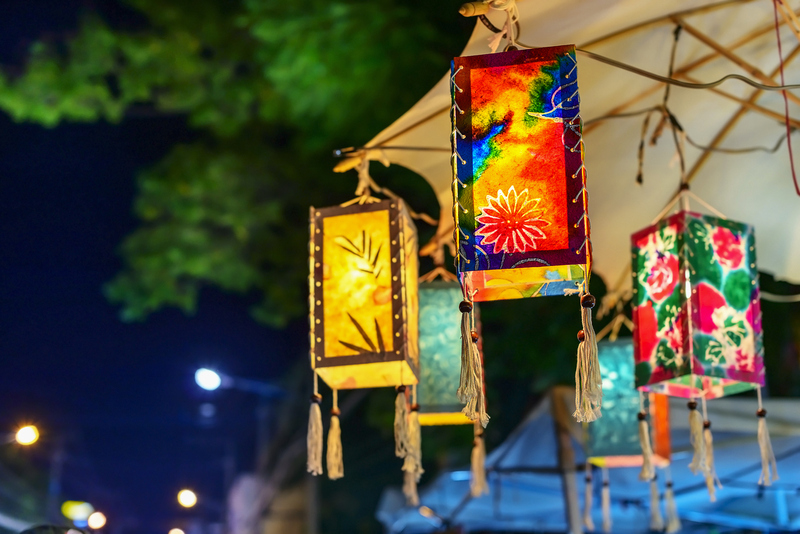 Experience Thailand's culture and traditions on this small curated journey of only 8 guests. Our journey to Thailand takes you to Bangkok, the Kwai river, Chiang Rai, Chiang Mai and even into Laos and Burma. Thailand is the ‘land of a thousand smiles’. Its exotic landscapes, rich Buddhist culture and palm-fringed beaches have been attracting sun-seekers for generations. 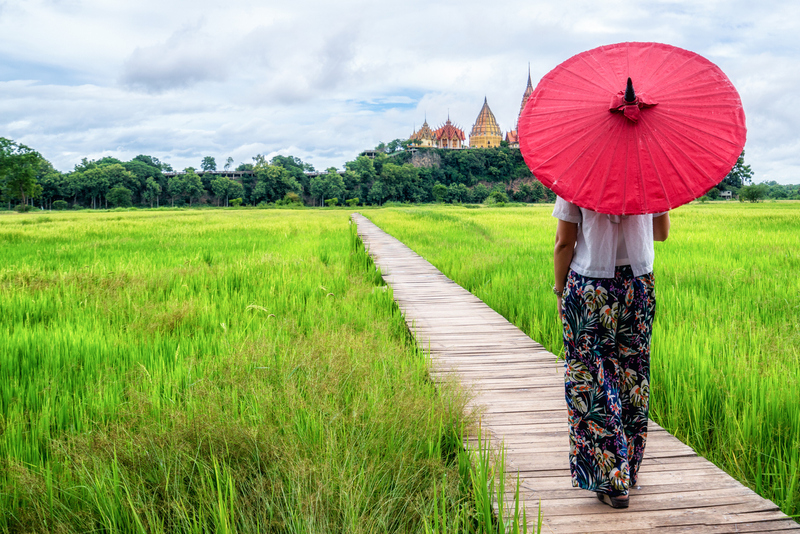 We have created an itinerary that takes you on a discovery the frenetic street life and stately palaces of Bangkok, that introduce you to the calm and authentic hill tribes of the north and that introduce you to neighboring Laos and Myanmar. Your host, Kris, knows Thailand inside and out and is the perfect host to give you a window into its culture, people and landscape. Walk through the thronging markets of Bangkok, barter to your heart’s content in vibrant night bazaars, uncover the sights and sounds of the jungle-covered mountains and hill tribes that surround Chiang Mai and Chiang Rai, see and interact with the mighty elephant in Thailand’s famed Golden Triangle, chant and meditate with the monks of Wat Sri Supan and sample some of the best cuisine the world has to offer. 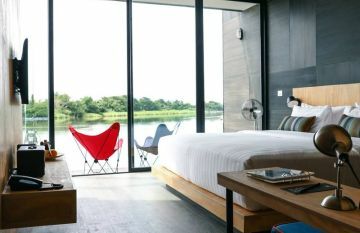 Glamping at the Four Seasons in Chiang Rai $11998Only 1 room left! Rates displayed are per person per journey, based on double occupancy. Solo travelers are welcome for a small single supplement fee . 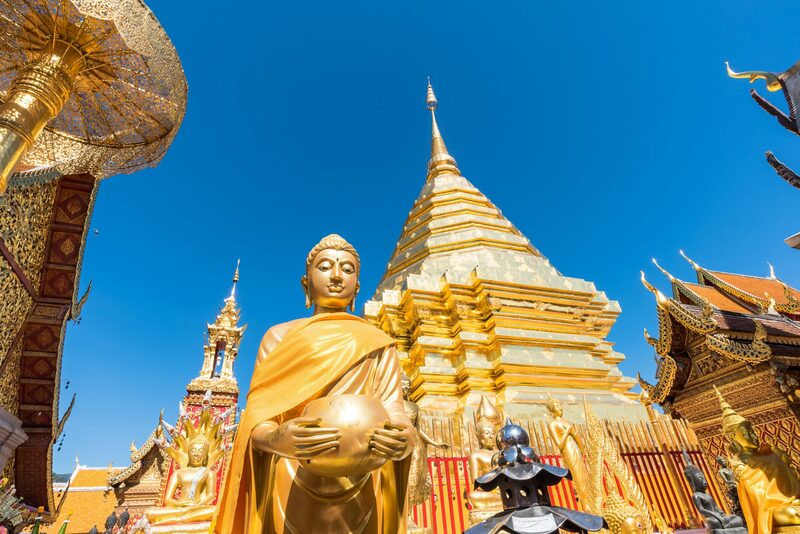 You will get to experience and learn about a Monk's typical day in the northern part of Chiang Mai, as well as witness a daily ritual as Monks descend the mountain through towns and villages. These two unique experiences could very well change the way you approach life. We have not forgotten to ensure guests get their daily exercise with a combination of fun and healthy (yet optional, of course) hikes and river kayaking experiences. In both Chiang Rai and Chiang Mai, jungles and rivers offer the perfect setting for walks to local villages and visit of local tribes. Get more from your personal guides and hosts by being part of a smaller group. Art In Voyage takes pride in limiting the size of its curated journeys to ensure a unique and personal experience each and every day. 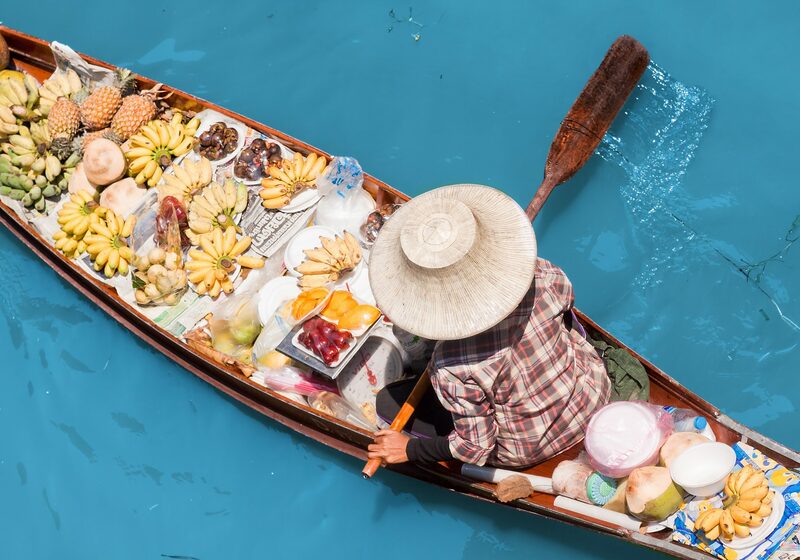 Early this morning, we depart for the Damnoen Saduak Floating Market where you will see traditional Thai lifestyles going back into history. We continue our journey to the Kanchanaburi province. A lunch stop will be organized (included). This afternoon, we pay a visit to the infamous bridge over the River Kwai and the Death Railway, built by thousands of allied prisoners of war captured by the Japanese. We explore the Death Railway Museum featuring photographic and physical memorabilia dating from the Second World War. 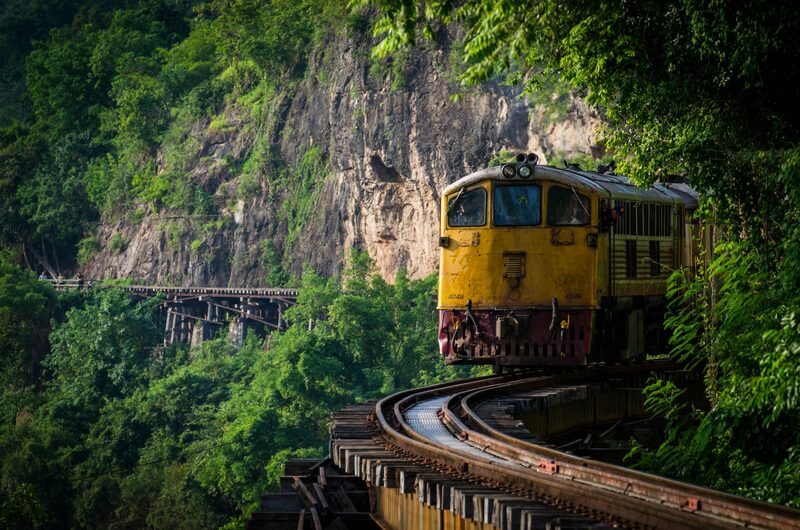 Take an historic train ride and enjoy the lush jungle scenery from the infamous railway. We are expected at our hotel late afternoon, on time to enjoy our river rooms. Dinner is at leisure. This morning, we head back to Bangkok to catch a flight to Chiang Rai, where we are greeted and transferred to our incredible estate, the Anantara Chiang Rai. After a long day traveling, enjoy the property's grounds and amenities. Tonight, experience one of the property's restaurant for dinner (included) after sipping on a lovely cocktail watching the sun set over the jungle and rice fields. Bring your passport and an adventurous spirit to investigate three countries in one day. 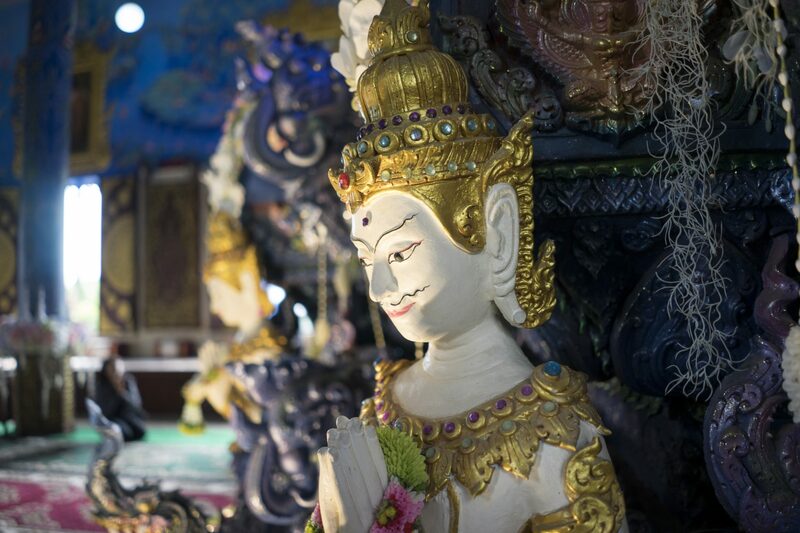 Explore the contrasting characters of Thailand, Burma and Laos. Hop in a tuk-tuk and head off to the food market. Enjoy meeting the locals and the thrill of new finds. Uncover age old traditions at Shwedagon Pagoda. Take in the mountain scenery before moving on to explore the spiritual treasures of Jade Temple. Then, re-imagine Chiang Saen’s time as the ancient Lanna Kingdom capital. Tour the scattered ruins of defensive walls and sacred temples, reliving the rise and fall of this historic town through the knowledge of your guide. Last, but not least, we board a traditional longtail boat to cruise the Mekong towards to Don Sao Island. As our final stop of the day, you might also be tempted to try a Beer Laos, and if you’re feeling braver, the potent rice whisky. Tonight, dinner is back at the property. After breakfast, transfer to visit Thailand’s northernmost town of Mae Sai, known for its large open-air market. We then start our journey towards Chang Mai. 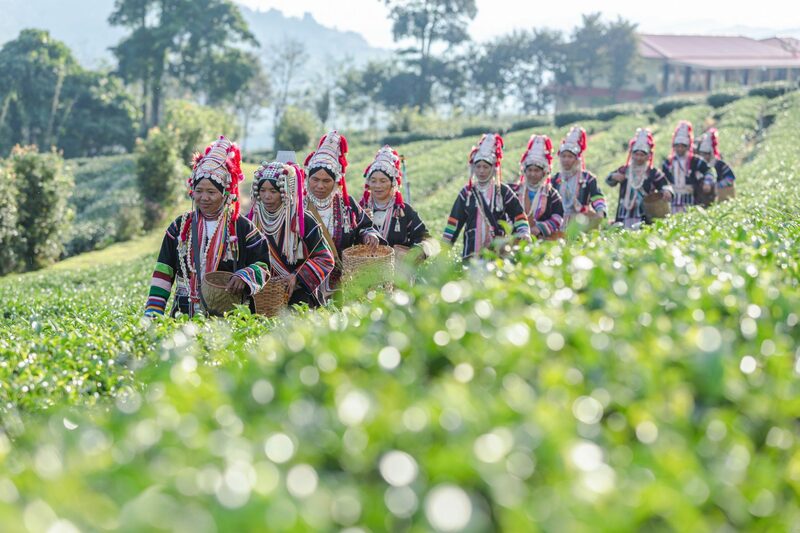 On the way, This morning we pay a visit to the Yao hill tribes, whose origins are in China, are heavily influenced by Chinese traditions, still using Chinese characters in the writing of their language. We then stop for a visit of the hot springs of Mekajan, where the mineral waters are believed to have curative and restorative properties. Lunch will be included on the way to Chiang Mai. Upon arrival at our property, the rest of the afternoon and the evening are at leisure. For the most courageous ones, start our day with a guided trek of Doi Suthep - Pui National Park, its temple and the Mon Tha Than Waterfall. Experience the grandeur and breathtaking views the trail offers as you walk among forests of bamboo, tall hardwoods, a variety of colorful flowers, and a diverse bird population. Other guests may enjoy a morning at leisure. After lunch (included for guests joining the trek), we depart and hold a cooking class with a local celebrity, Chef Sawat. Discover his organic farm and its Thai herbs, vegetables and tropical fruits. After picking the ingredients, start your cooking class and enjoy your efforts with dinner before returning to our property. On option this morning, rise at dawn and witness dozens of monks streaming down the mountain to the city of Chiang Mai to receive alms from the locals in a visually striking daily ritual. After breakfast, we drive to Wat Sri Supan and join a monk chanting ceremony. We continue our day of meditation with the visit of Wat Chedi Luang, a historic temple that once housed the Emerald Buddha, now held in Bangkok’s Wat Phra Kaew. There, enjoy a 20 minute rickshaw ride through the quiet streets of the old town before returning to our property. Tonight, we say farewell in an exceptional setting and dinner, paired with excellent world wines. This morning, catch a flight to Bangkok where your international journey begins. Interested in Extending to Phuket, Ko Samui or other exotic parts of Thailand for a few days of R&R, let our experts design the perfect customized extension to suit your preferences and interests. X2 (pronounced cross-to) River Kwai is located at the most beautiful stretch of the Kwai Noi River with its spectacular view and backdrop of mountain ranges and blue sky. Traveling to the Kanchanaburi resort, one will pass-by rice paddy fields, sugar cane plantations, local temples and villages which are the signature scenery of Kanchanaburi. 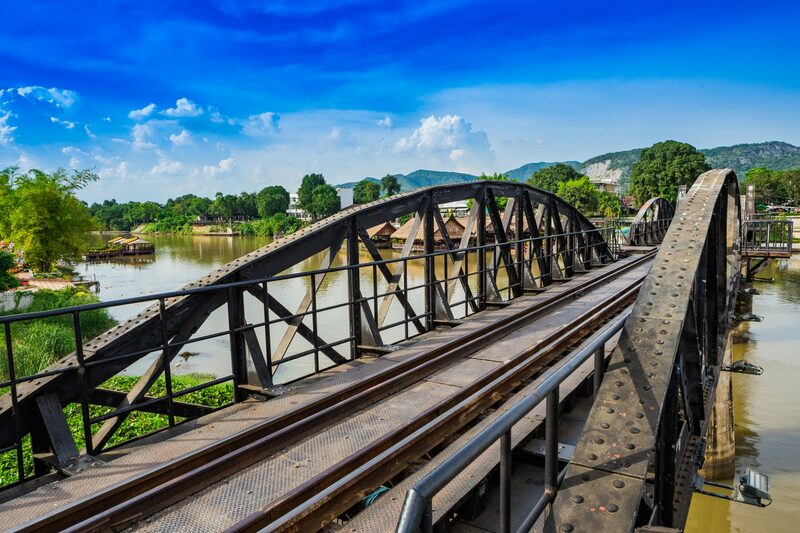 X2 River Kwai consists of 22 rooms – all facing the spectacular Kwai Noi River. 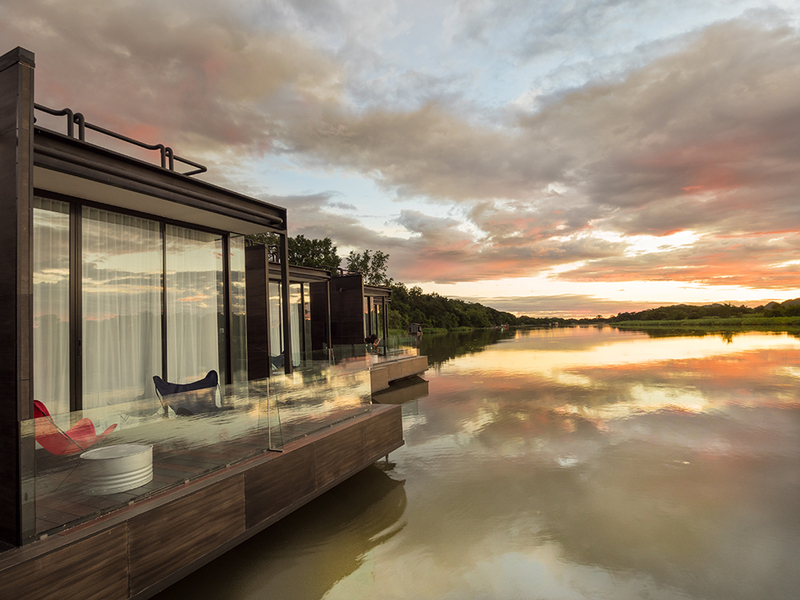 The unique XFloat Cabins rests upon the rivers surface and come with full amenities including bathtub, private rooftop sundeck and speculator river views. 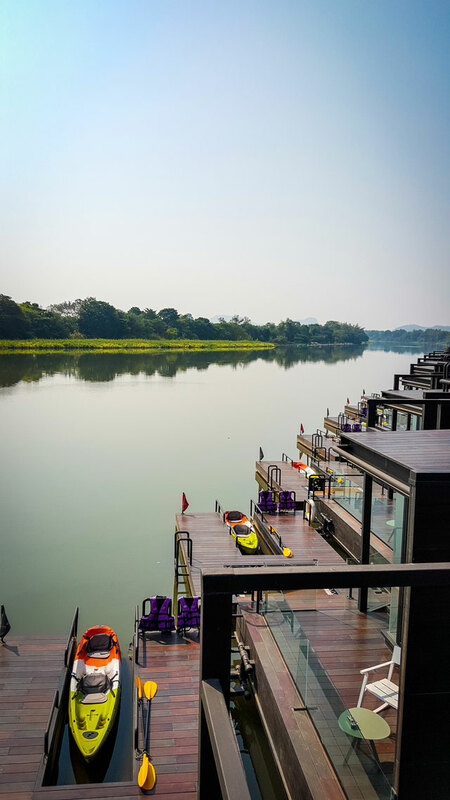 The facilities include a river view restaurant with an outdoor deck, The Bridge Bar & Bistro, library, an infinity riverfront pool with sun lounges and sun beds, bicycles on loan, free wifi in all common areas, guarded car park and iPads on loan. 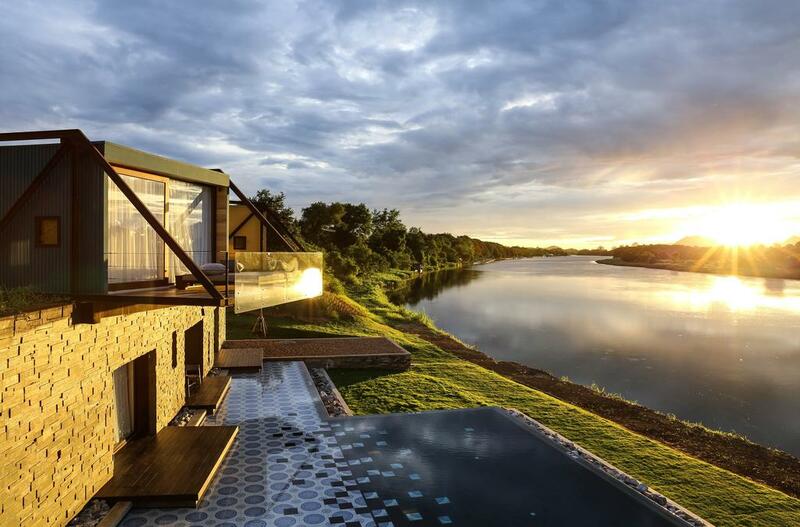 Discover the legendary Golden Triangle up in the north of Thailand, at the fantastically luxurious Four Seasons Tented Camp, stunningly located on the border of Thailand, Laos and Myanmar, and overlooking the Mekong River. Usually accessed by river boat, and set amidst Thailand’s exotic bamboo jungles, there is a spectacular and unique experience awaiting the more active at the safari-style Four Seasons Tented Camp. With just 15 supremely luxurious tented accommodations – complete with roll top baths and attention to detail that is second to none – a three or four night adventure here is inclusive of exquisite cuisine, wines from the cellar as well as many activities such as learning how to train the camp’s elephants, river trips on the mighty Mekong and learning more about this fascinating region’s culture and tradition. 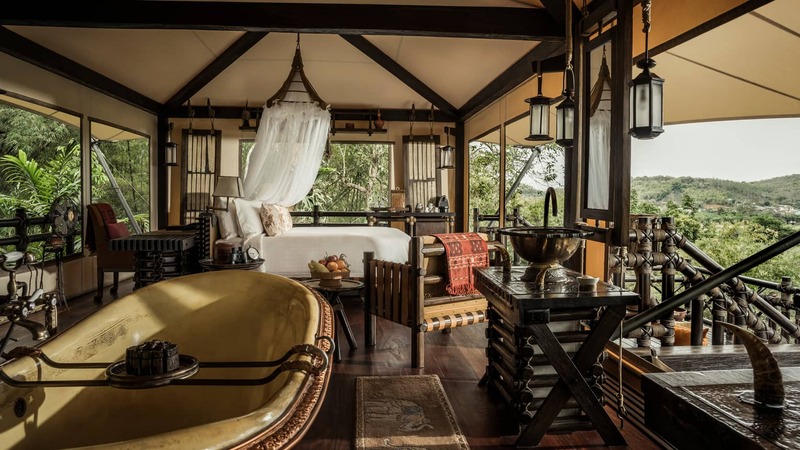 The tents themselves have got to be seen to be believed, you’d be forgiven if you thought you’d just stepped into a luxury city hotel room, until of course you look out the windows to the dramatic landscape encompassing you. A wonderful Four Seasons resort set in a tranquil, idyllic location. The perfect luxury base from which to explore the local culture, relax, enjoy the peaceful surroundings and experience excellent service and facilities. 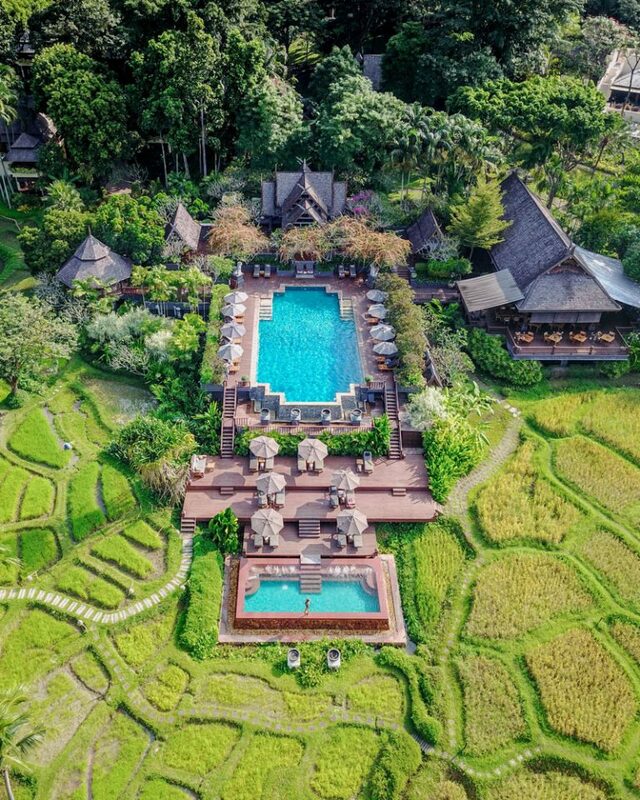 The Four Seasons Chiang Mai is a stunning property set in the beautiful Mae Rim Valley, just north of Chiang Mai. 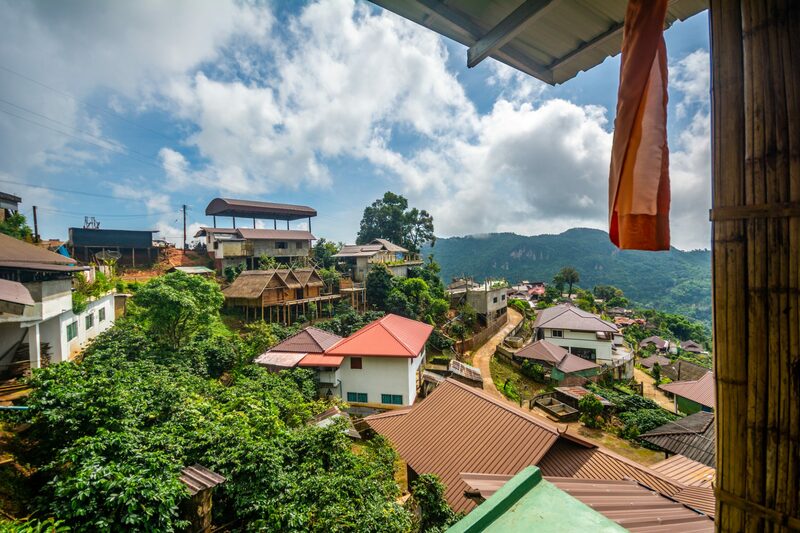 It is designed like a traditional Thai village, laid out around working rice terraces and surrounded by mountains, and a stay here feels like stepping into another world yet is just 30-minutes drive from the center of Chiang Mai. The spacious pavilions and huge residences are luxuriously appointed with local touches, and all have outdoor salas with daybeds. Twelve luxurious one-bedroom villas set in tropical gardens have been added to the portfolio at the Four Seasons Chiang Mai, with stunning views onto the mountains and spacious private pools. The renowned cuisine here must be sampled to be believed and not only is the food incredible but the settings for the various restaurants simply stunning. For the ultimate in romance, the Rice Barn is a private dining venue for two overlooking the resort’s rice paddies and lake – after a five course candlelit meal, designed by yourselves with the chef, you can release a krathong – or banana leaf cup – containing a candle, onto the lake in traditional Thai style. 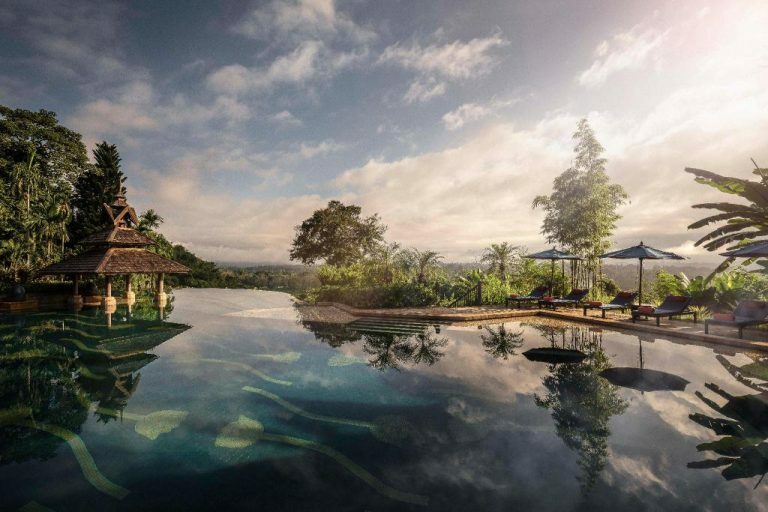 Perched on a ridge in northern Thailand overlooking the border with Myanmar and Laos, among the finest Chiang Rai hotels, Anantara Golden Triangle immerses you in once-in-a-lifetime experiences. 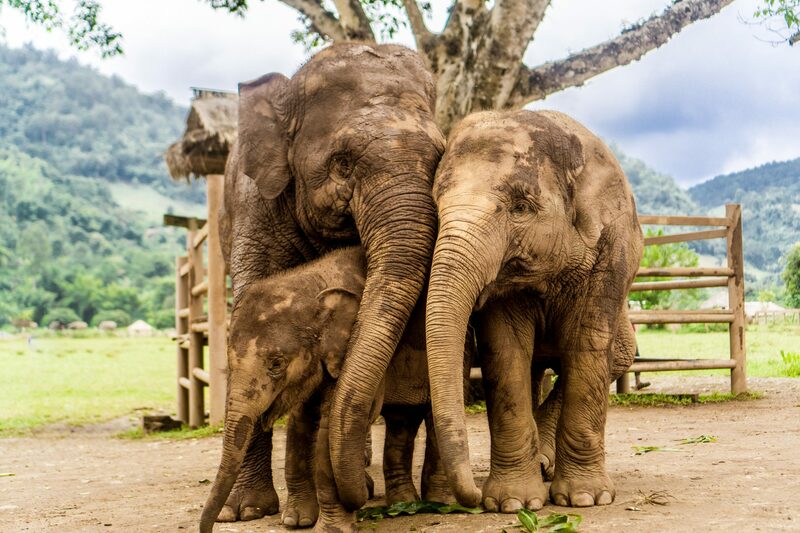 Bond with elephants at our mahout camp, Spa in the jungle, Cruise down the Mekong River, exploring the unique cultures of three countries. Dining at the Anantara Golden Triangle is a culinary journey through centuries of Lanna culture and Old World European favorites, and both restaurants have dramatic views over the valley and its surrounding landscape. The Elephant Bar and Opium Terrace serves casual meals and fabulous cocktails. The Anantara’s signature Chiang Rai spa comprises teak wood suites perched high above the Thai and Burmese jungle and uses ancient Thai remedies as well as pioneering treatments from across the globe. After your treatment relax in one of the private open air terrazzo tubs with views across the valley. The Anantara Golden Triangle prides itself on its private elephant camp and this is a wonderful place to experience these great animals first-hand by walking with them through the bamboo jungle, helping bathe them or even spend a full day learning how to master the art of being a mahout. 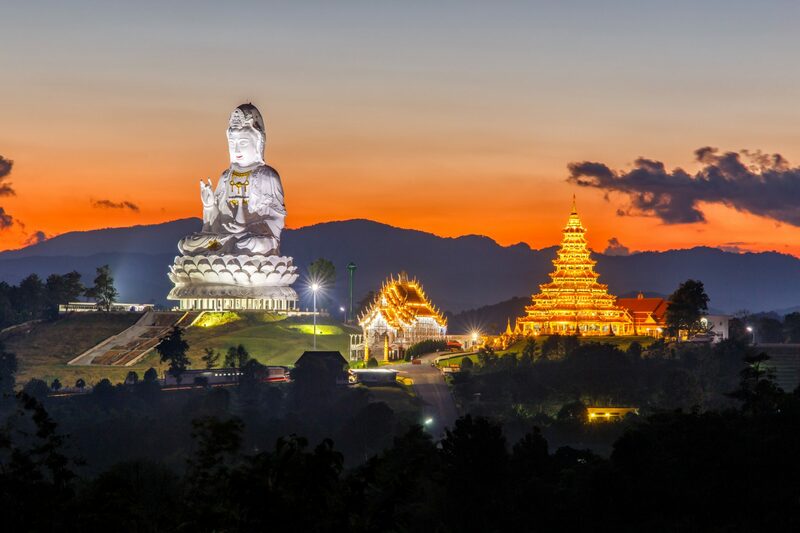 There is an abundance of other activities on offer during your stay at the Anantara Golden Triangle, including visits to Chiang Rai and to the neighboring countries by long tail boat, yoga, mountain biking, tree planting, trekking and a wonderful Thai cookery school where the chef personally takes you to visit the local market. 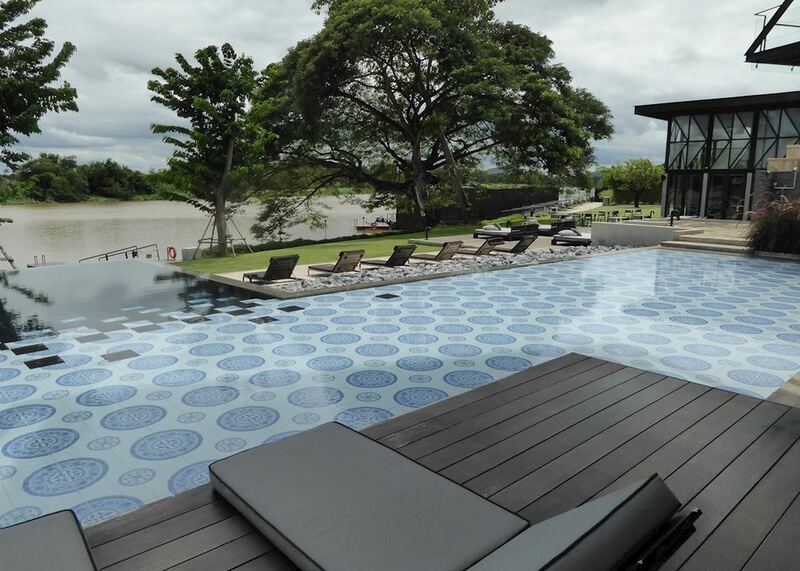 Alternatively enjoy the magnificent free form infinity-edged swimming pool looking down over the tree canopy towards the Mekong River. 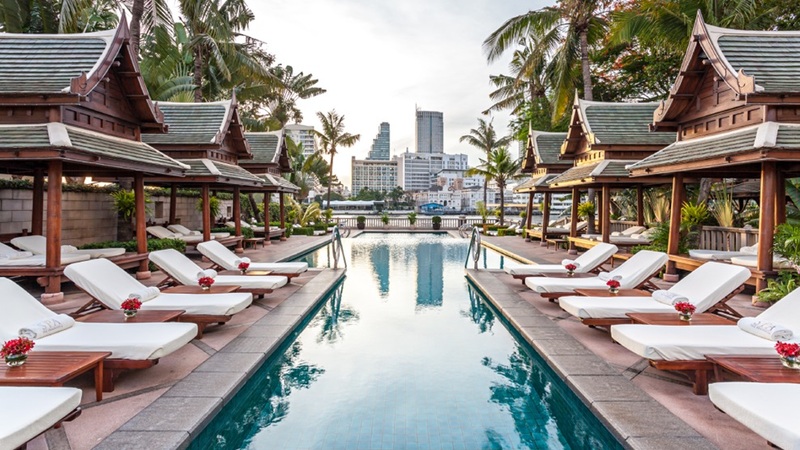 The Peninsula towers over the western side of the Chao Praya, a short ferry or boat ride away from the Saphan Thaksin skytrain station and the city’s main historic sites, including the Royal Palace. It’s a little further to the city’s downtown shopping and nightlife meccas, but for all those who want sumptuous tranquility and amazing views, it is the perfect property. It is a classic luxury urban resort offering neoclassical international elegance effortlessly coupled with contemporary Thai design touches. This makes for a subdued, formal ambiance in the spacious public areas of the hotel, especially in the imposing lobby area. The deluxe rooms (upgrades available – ask us) are offer spectacular views of the Thai capital’s soaring skyline across the river. 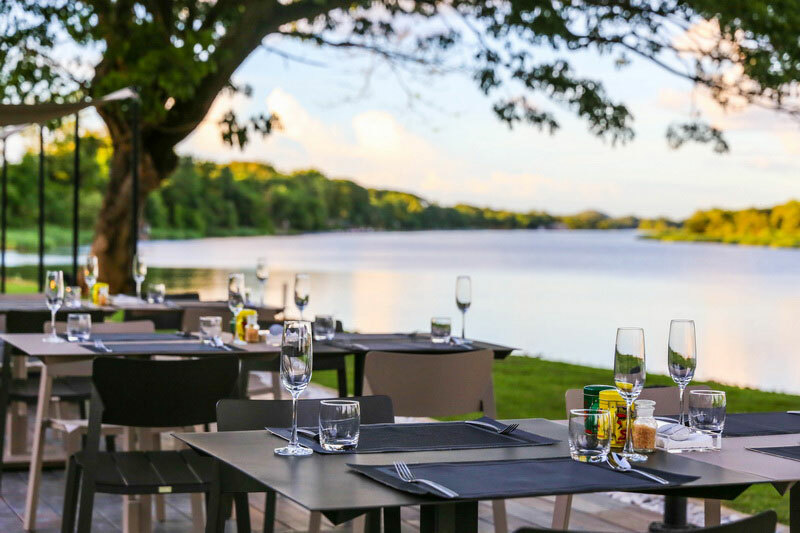 In addition to the property’s many lovely restaurants, the River Bar is the place to enjoy a cocktail or glass of wine before dinner. Breakfast is a sumptuous buffet affair with plenty of Asian and western selections, great juices, and freshly cut fruit, best enjoyed outside by the river. 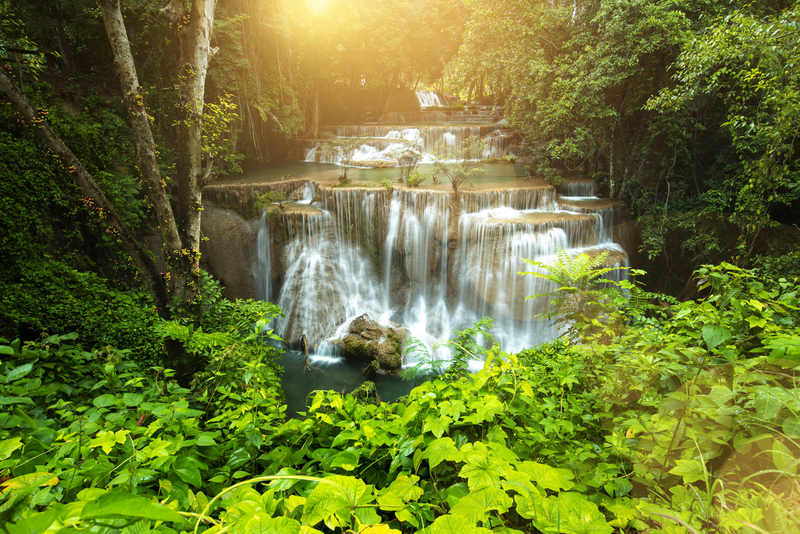 When traveling to Thailand, a world of opportunities open up. You are close to Cambodia, Laos, Nepal and even Sri Lanka. For those seeking isolation, how about the white sand beaches of Seychelles or the Maldives? If flying on Emirates, a stop by Dubai, its bustling city and incredible desert landscape is a must. Wherever your extension may take you, we are here to assist in putting together, piece by piece. A refundable deposit* of $2500 per person is due at the time of your reservation. In case of a cancelation at more than 90 days prior to departure, your deposit will be returned minus a $250 per person administrative fee. Solo travelers welcome for a small single supplement of $.